The stock market has bucked “Sell in May and go Away” this year. It has gone up every single month in Q2 2018 (April, May, June). When the stock market bucks bearish seasonality (i.e. the stock market goes up when it “should” go down), the stock market’s future returns are very bullish. 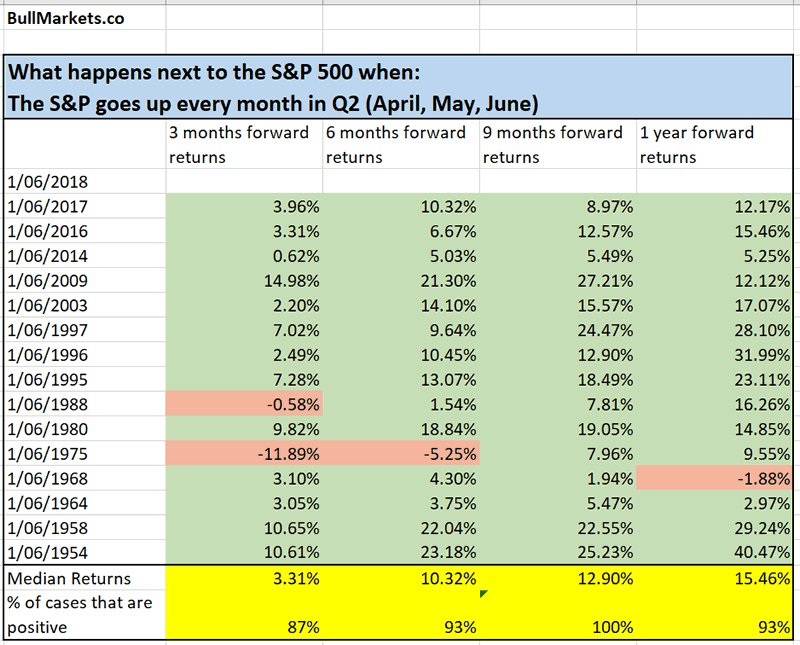 Here’s what happens next to the S&P 500 when it goes up every month in Q2 (April, May, June). We’re using the monthly CLOSE $. When the stock market goes up in April, May, and June, it’s usually in a “big rally” within a bull market. That’s why the stock market’s future returns are so bullish. The stock market usually goes down in April, May, or June during “significant corrections” or bear markets. This supports the Medium-Long Term Model. Based on the current data, the Medium-Long Term Model suggests that the next “significant correction” or bear market will probably begin in the second half of 2019. 12.9% above the S&P’s current level (2718) is 3068. This suggests that the S&P 500 will probably close somewhere in the vicinity of 3000 at the end of this year.